The use of money in China could be traced back to at least four thousand years ago. China was also the first country to use paper money, or credit currency in the world. Ancient paper money can only be described in general terms for lack of material objects. About the Pai-Lu P'i-pi (white deer-skin money) of Han Dynasty and the Fei-Chien (flying money) of Tang Dynasty, I personally have never seen the actual objects. However, the official issuing of paper money in Sung Dynasty is famous in the field of numismatic. [Chiao-Tzu (1008AD) and Chien-Yin (1105AD) of Northern Sung and Hui-Tzu (1160AD) and Kuan-Tzu (1131AD) of Southern Sung]. The use of paper moneys went on through the Yuan and Ming as well as the end of the Qing Dynasty. Paper money played its important roles in different stages of the money history of China. I post below is an email from Ms. T. P. of West Danville in the state of Vermont, in an area called the Northeast Kingdom. It's very beautiful this time of year. She is not a collector of money, but her grandparents came to the country in the early 1900's. The note was given to her Father over 50 years ago by a very old Chinese lady. 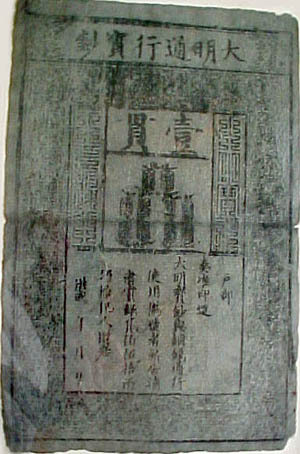 a 'Great Ming Circulating Treasure Certificate'. who told him that it was very old and very valuable and to keep it safe. Since then it has been in a picture frame, covered by a glass all these years. I would appreciate it, if you could help me find out if this is real. Ta Ming T'ung Hsing Pao Cha'o was first issued by Chung-Shu-Sheng (Cabinet of Ministers) in six denominations of 100 wen, 200 wen, 300 wen, 400 wen, 500 wen and one string. [Each string was quivalent to 1000 copper cash or one tael of pure silver or one-fourth tael of gold.] in the eighth year of the Hung Wu reign (AD1375). In 1389, fractional notes were issued additionally in five denominations: 10 wen, 20 wen, 30 wen, 40 wen and 50 wen. In the 13th year of the Hung Wu reign (AD1380), the right of printing notes was transferred to Hu Pao [Ministry of Interior and Finance]. From 1375, Ta Ming T'ung Hsing Pao Ch'ao was issued through the entire Ming Dynasty. It is special that the reign title "Hung Wu" (AD1368-AD1398) appeared on the notes lasting for the whole Ming period, even the other Ming emperors did not change it, though they had their own reign titles. It is very difficult to identify an ancient note by just looking at the image throught computer. But I believe this note is authentic. The two red seal handstamps are not so clear, but luckily I still can find the marks remained on the surface from the close-up image. I think it is because they are fading away naturally after hundreds of year. As I know that all the Ming notes were made with mulberry paper. Mulberry paper should be lighter in colour. But we may find that all the Ming notes are in blue-grey. Actually, mulberry paper using for Ming notes were re-made with the waste official documents and the examination papers of the Ming Government. We may also find that none of the Ming notes have surfaced. On the obverse of this note, there are six Chinese characters "Ta Ming T'ung Hsing Pao Cha's" [Treasure Note of the Great Ming] in K'ai Shu (regular style) at the top. The below outer frame is ornated with the dragon patterns. The center upper was printed with the face value "I Kuan" [One string] in K'ai Shu (regular style), and the center lower were printed with diagram of 10 strings of ten cash each. On the both sides are eight Chinese characters "Ta Ming Pao Ch'ao, T'ien Hsia T'ung Hsing" [ The Great Ming note, circulates everywhere.] in Chuan Shu (seal style). 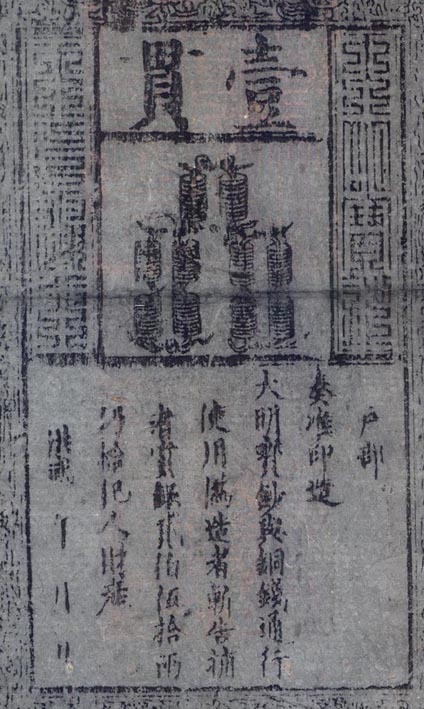 The center lower is written in Chinese "This Ta Ming Pao Cha'o is printed with the approval of the Emperor through the Hu Pao and used side by side with the copper cash. Those who counterfeit Ta Ming Pao Cha'o will be beheaded while an informant will be rewarded with 250 taels of silver with confiscated property of the convicts into the bargain.] "